Dorris E. Bone, 95, died on Saturday, March 10, 2018, at Life Care Center of Collegedale. She was preceded in death by her husband of over 40 years, John W. Bone and daughter, Debra Bone. In addition, she was preceded in death by her parents, John Ristie McGhee and Viola Charlotte McGhee; brothers, Thomas and John Frank McGhee, and sister, Sonia McGhee Williams. 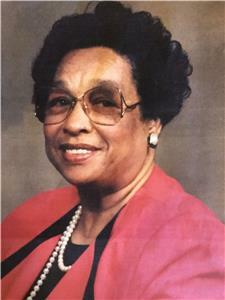 Dorris was a graduate of Howard School, Class of 1940. Her survivors include her daughter, Alice F. Bone Oliver of Port Ludlow, WA; niece, Karen (Melvin) Purnell-Engramof Orlando, FL; nephews, Boyer (Virginia) Purnell, Franklin (Kathy Ann) Purnell and Michael McGhee all of Chattanooga; sisters-in-law, Wynona McGhee, Chattanooga, and Jacola Gaines, Columbia, Tn. She is also survived by a host of great nieces and nephews and her special adopted sisters, Dorothy (Erskin) Peoples, Pat Varnell, and Evelyn S. Young . Funeral services will be held on Friday, March 16, at 11 a.m. in the Chapel of the John P. Franklin Funeral Home. Visitation will begin at 9 a.m. with the family being available at 10 a.m. Burial will take place at the Chattanooga National Cemetery. In lieu of flowers, the family request that you make a donation to your favorite charity in memory of Dorris. Final arrangements have been entrusted to the John P. Franklin Funeral Home, 1101 Dodds Ave., Chattanooga, Tn., 423 622-9995.